I scoured the interwebs (I love using that word now. Interwebs!!) looking for vegan and eggless cupcake recipes. While the previous vanilla cupcakes I made came out quite well, I didn’t want to use another recipe with so much condensed milk. It’s just that the thought of all that condensed milk was making me cringe a little, you know? I found a few using milk, milk+ vinegar and other substitutes like coconut milk. 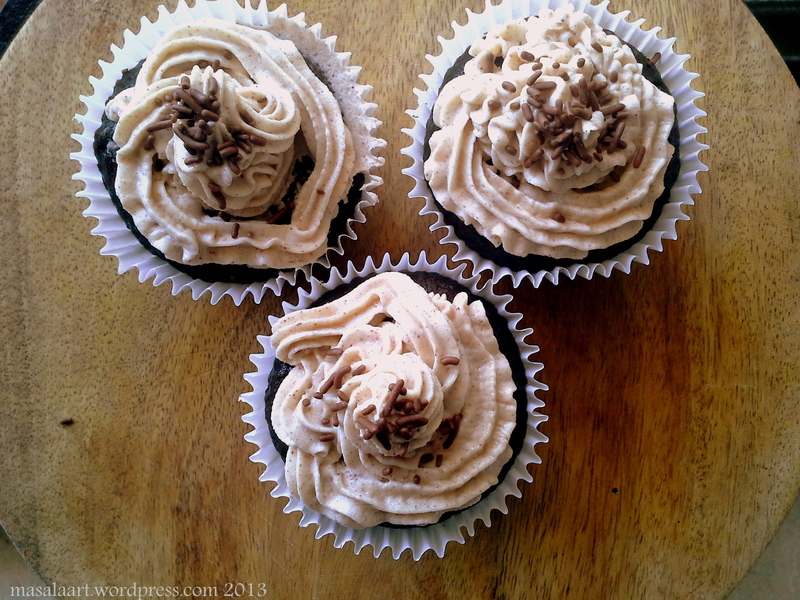 I spent a week baking till I found the perfect recipe…well, for me at least! This one is from fussfreeflavours.com, really simple and uses ingredients that can be found in any pantry. It was created by the author as an alternative to those times when free-range eggs are not available. The blog itself states that it is by no means a perfect recipe, and it came out just about ok. The texture was fine, but taste-wise, it didn’t hit the mark- it had that baking soda aftertaste, if you know what I mean. As you can see, the tops kind of deflated and sunk in when I checked for done-ness. This one is from a great site I discovered that has some wonderful vegan cupcake recipes, loveandoliveoil.com. The recipe calls for my new obsession, almond meal, and the cupcakes looked so pretty and light I just had to try it out. I did fiddle around with the recipe a little though. I used regular whole milk instead of soy milk. 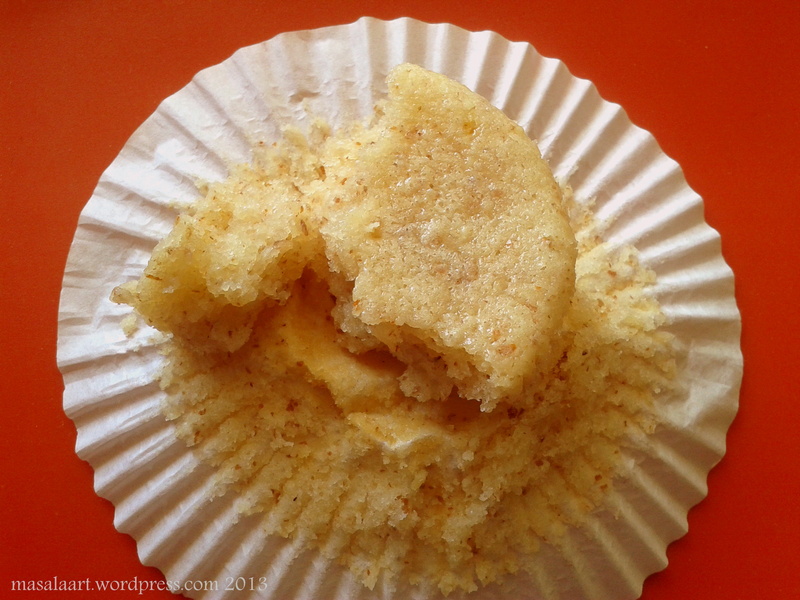 These tasted great and the crumb was nice and moist; however some of the cupcakes were a little raw in the centre. Right now, I’m thinking I got a little carried away with changing the almond meal:flour ratio. If you know my love for all things chocolate, then you know I would not be able to rest without trying out at least one chocolate flavoured recipe. These came out wonderfully, and this time around, I stuck to the recipe. No complaints here! I tried my hand at another round of frosting! Still shaky, but better than the last time. I had actually pretty much decided to stick to this one, but then, I chanced upon another recipe which tempted me more. And boy, oh boy, did those cupcakes turn out to be more dense, decadent and gorgeous than these! 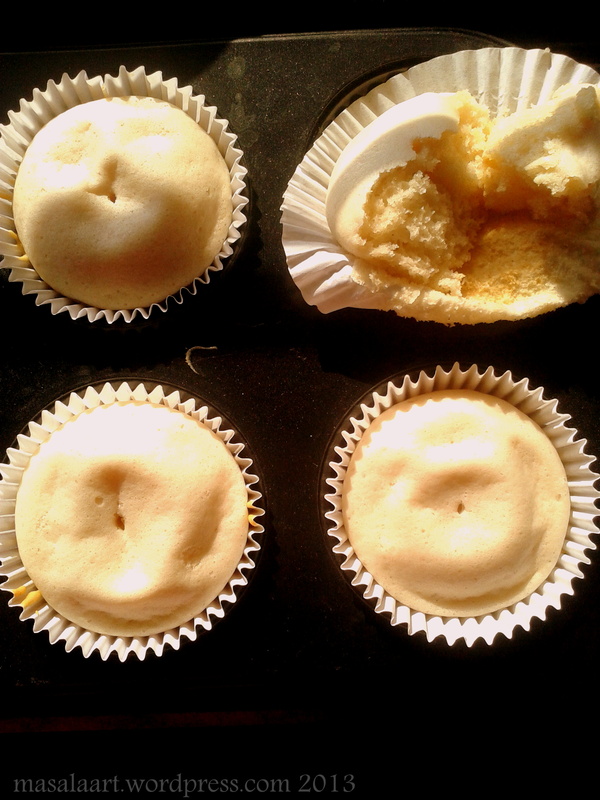 It’s not that I don’t have the space in this post, it’s just that I wanted to add a part-2 to my Adventures In Eggless Cupcake Baking. I love these experiments my friend, your second attempt was my favourite I think – that crumb was so yum! A great vegan egg substitute is ground flax seed mixed with some water. Isa Chandra Moscovitz’s book Vegan Cupcakes Take Over the World is a great source! You know I have read so many reviews of that book, I think it’s time I picked it up now!